by Sylvia Norman, Founder & CEO at Molecular Diagnostics Consulting, Inc. and Sandhill Crane Diagnostics, Inc. 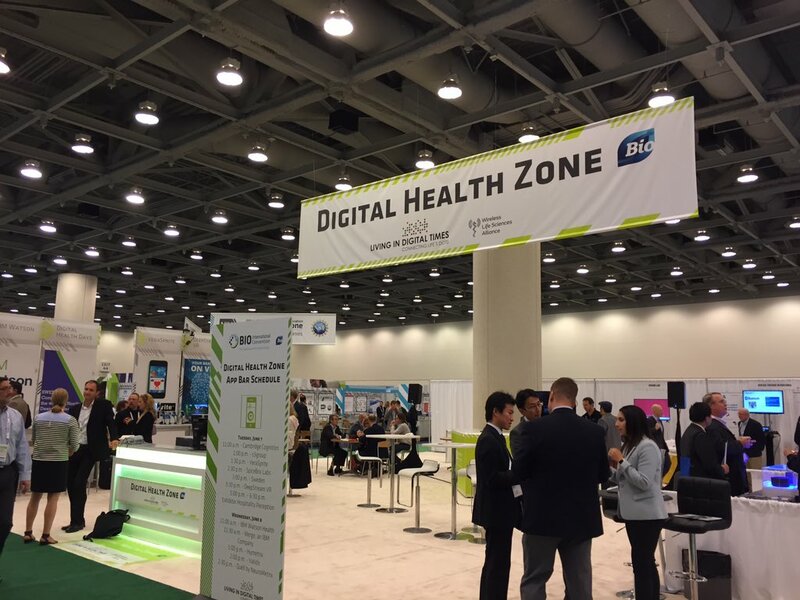 The focus at the Digital Health Summer Summit at BIO 2016 (DHSS 2016) and BIO Digital Health track was all about igniting innovative changes in healthcare through digital health. The conference started off at warp speed as Dr. Shafi Ahmed treated us to a demo of his surgical virtual reality (VR) platform, providing each attendee with VR headsets for a truly immersive experience. In April, Dr. Ahmed performed the first ever live-streamed VR surgery using this platform. His vision is for the platform to become a VR surgical teaching tool. This presentation was followed by demos of digital health innovations, including a virtual rehab gamification for stroke patients (Virtualware), a non-invasive cognitive health tool to identify risk of cognitive decline e.g. Alzheimer's (Neurotrack), an injectable biosensor that monitors oxigenation index and glucose in real time (Profusa) and a connected SmartinhalerTM to monitor usage by COPD patients (Adherium). Elli Kaplan, co-founder & CEO at Neurotrack emphasized the need for early cognitive risk assessment tools, since studies have shown 20+ years of irreversible brain loss occurs prior to an Alzheimer's diagnosis. Neurotrack's ImprintTM Cognitive Assessment Test tracks eye movement while the subject views identical and non-identical images. Unimpaired subjects spend more time viewing non-identical images, impaired subjects do not. Panel discussions over the next few days focused on market opportunities, investment outlook, and challenges facing digital health companies developing products for use in healthcare settings. Market Opportunities - The primary market opportunities are in mental health technology, products for caregivers of our aging population, medical-grade wearables, big data analytics, and telemedicine. The mental health technology panel proposed that digital health's greatest impact will be on behavioral and mental health, by providing tools for digital therapy and analysis of complex data to identify treatment targets. To give an idea of the challenge in identifying mental health biomarkers and treatments, there are 126 symptoms included in the diagnosis for depression. Jeff Beeler (VP of Product Innovation at Merge eClinical) gave us an informative peek into how cognitive technologies work and reminded us that even Watson can't provide actionable data without additional tools - "You can't just give Watson the data, you have to teach him how to use it". For the aging population market, products to assist with mobility, independent living, in-home care, cognitive health, and remote healthcare are needed. Investment Outlook - Investment in digital health is strong, as shown in this 2016 mid-year report. The biggest digital health sectors for investment in Q1 2016 were 1) Wearables & Biosensing=$202M 2) Big Data Analytics=$107M 3) Population Health Management=$103M 4) Personal Health Tools & Tracking=$103M. There is some concern that digital health is in a funding bubble, but Wainwright Fishburn Jr. (Partner, Cooley LLP) and other panelists disagreed. Jody Holtzman, SVP, Enterprise Strategy Innovation, AARP said the caregiver market alone is expected to reach $72B by 2020 with a need for digital health products for medication management, safe living, care coordination, social engagement, diet & nutrition, etc. Challenges - It's anticipated that companies developing medical-grade wearables and other digital health devices will face regulatory and reimbursement hurdles. Since this is new territory for digital health companies, many panelists stressed the importance of involving the FDA and insurance companies in discussions early in the development process. They also emphasized the need to involve end users e.g. physicians, caregivers, patients and payors in the design process. This industry has previously placed more emphasis on designing for "wow factor" than designing for the end user. Panelists also discussed challenges in designing devices for integration into clinical trials, since there can be no scale-up requirement or workflow changes. For me, an exciting aspect of the digital health industry is the need for collaborations between tech, biotech, pharma, healthcare, and academia. The igniting partnerships portion of the conference highlighted case study collaborations between Johnson & Johnson, WellDoc and Samsung for Type 2 Diabetes management and between UCSF and CISCO for integrated healthcare platforms. Challenges to creating and maintaining these types of partnerships include selecting the right team members, addressing interoperability issues early on and clear definition of tasks. My favorite part of BIO conferences is the Digital Health Zone where attendees get to play with some of the exciting technologies discussed in the sessions. This year, the most engaging technology was a biofeedback virtual reality game (by Deepstream VR) that assists in relaxation. It was so impressive, I'm on the waiting list for when the product launches. Looking forward to hearing about all the great new digital health innovations next year when the BIO 2017 conference comes to San Diego. Sylvia, fantastic article. Great to hear about the latest and greatest. Thrilled to learn that BIO will return to San Diego in 2017.